Edge is a community that embraces young people who have been disillusioned by school and are up for the challenge of re-imagining learning. We offer a “cutting-Edge” approach that combines self-driven inquiry and interdisciplinary study. Our program welcomes juniors and seniors who have the desire to discover and explore their passions. All of our members — warmly named “Edge Makers” — engage in yearlong, individualized pursuits during which we research questions, themes, or problems of our choice. We investigate our topics using the larger content areas of Literature, Science and History. To support our journeys, we approach each other with kindness and empower ourselves to design our best work. We create collaborative environments that prepare us for the ever-changing 21st century landscape, and we share creative representations of our learning with others. We develop self-understanding and protect our capacity for play. We unveil and champion our collective passions. Our work in Edge propels us toward meaningful careers in college and the workplace. Many state universities, liberal arts academies, technical colleges, and other schools have embraced our students and their approaches to learning. 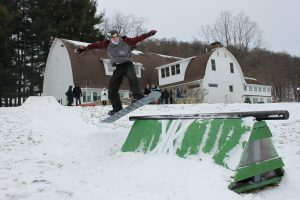 Ben leaps onto a rail he constructed for his terrain park project. 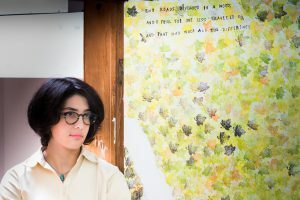 Michaela stands in front of a door she painted in the Edge building. Those of the Edge students who elect to pursue additional education enjoy rich post-secondary careers in liberal arts academies, state universities, technical schools, art schools, and other institutions. Since the program’s inception in 2013, our Edge Makers have received offers of admission to 64 domestic universities and 5 international institutions. Visit our College Advising page for more information about life after Kildonan.